Treatment for corneal disease:Your eye doctor can check for corneal disease and trauma by examining your eyes with magnifying instruments. Using a slit lamp and advanced diagnostic technology such as corneal topography, your doctor can detect early cataracts, corneal scars, and other problems associated with the front structures of the eye. 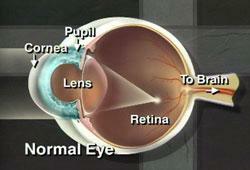 After dilating your eyes, your doctor will also examine your retina for early signs of disease. As with any serious eye infection, corneal disease should be treated immediately. Althoughcorneal transplant is almost always the necessary treatment to restore vision when the cornea becomes clouded, there are other measures that can be taken to prolong vision in the early stages of disease. To learn more about corneal disease you may choose to contact one of our offices to request an appointment. CallBloomfield:860-243-2020 or Windsor:860-688-1549, or click here to send us an appointment request.